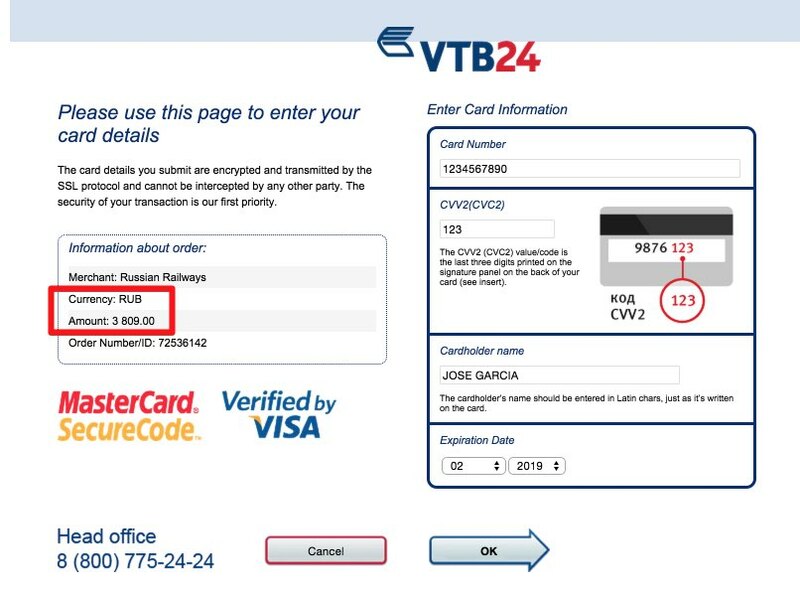 In this tutorial, I explain how you can shop online, without the middle-man, and purchase your own train tickets to travel in Russia through the official website of Russian Railways RZD, the state-owned Russian rail transport company. 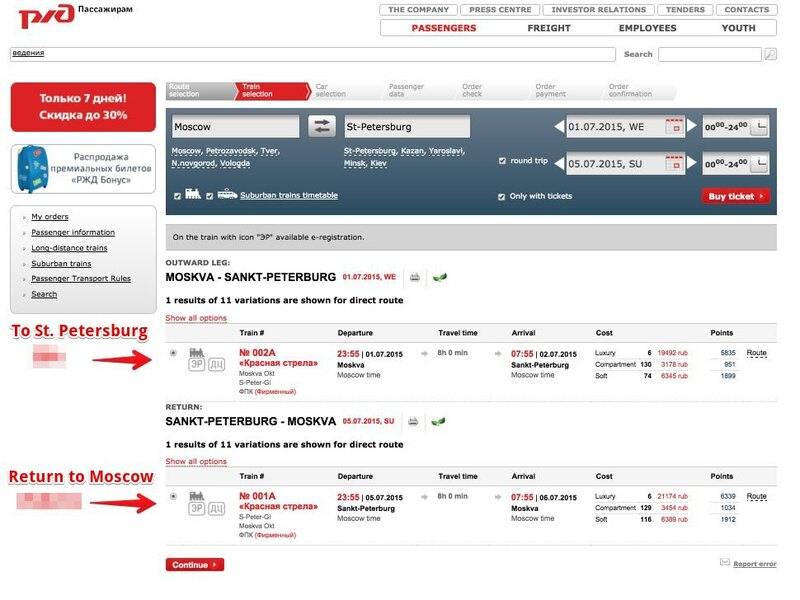 In recent years, private intermediary companies have proliferated online, offering tickets for rail travel in Russia, from Moscow to St. Petersburg, Siberian, etc. However, the cheapest way to do this is by avoiding intermediaries altogether and instead purchasing your own tickets through the official website of the national rail company Russian Railways (RZD). Until recently, the website for RZD was only available in Russian, but it is now available in English as well. In this post, I offer a simple tutorial on how to buy a roundtrip ticket between Moscow and St. Petersburg on the classic Red Arrow train. However, the reservation process is the same for whatever trip you choose throughout Russia’s extensive territory. As a preliminary step, before beginning the process of purchasing tickets, you’ll need to register as a user on RZD’s website. Once you have an account and have accessed the website, the first step is to head to the English language search form, which is located here: http://pass.rzd.ru/main-pass/public/in. On this form, under the”Departure” and “Arrival” fields, you can easily select from amongst the major Russian cities(Moscow, St-Petersburg, Petrozavodsk, Nizhny Novgorod, etc.) or other countries (Kiev, Minsk,etc.) listed with a single click. Between the departure and arrival fields, there is a button with two arrows that can change the direction of your trip with a single click. Once you have selected the outbound trip and/or the return trip as well as the dates, you can click the button to purchase your tickets. You will have to provide information on the number of passengers traveling with you and your own personal data later on in this process. When you click “Buy ticket”, all available trains will appear for the selected route. 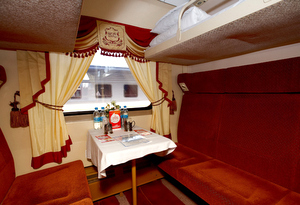 For example, to make the journey from Moscow to St. Petersburg, you can choose from a variety of different trains, among which are the high-speed day train “Sapsan” (“САПСАН”) that only takes about 4 hours, and the night train “Red Arrow” (“Красная стрела”), which has compartments with sleeping berths and makes the journey in about 8 hours (from 23:55 until 7:55 am). On the next screen you can see the different types of train compartments. Compartment (2nd class Kupe). This is a standard compartment for four people, including two lower and two upper berths, or beds. The compartments located at the beginning and end of each train car (next to the Water Closet) are for two people. This is the most economical option (see photo below). Soft (1st class). This compartment has a higher level of comfort for two people and has two bunk beds. This type of compartment is more expensive. 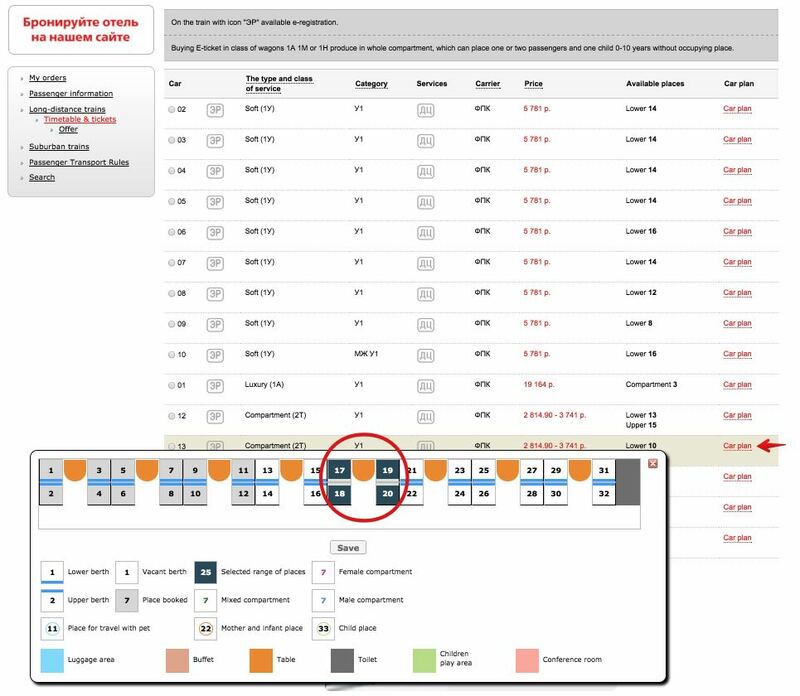 You must select the type of compartment and click on “Car Plan” to select the location of the seats. In the screenshot below I chose four seats in a standard compartment for four people (17 to 20). They are marked in dark blue (the orange shape is the table in the compartment). The squares marked in gray are already reserved. The white squares are the available seats. 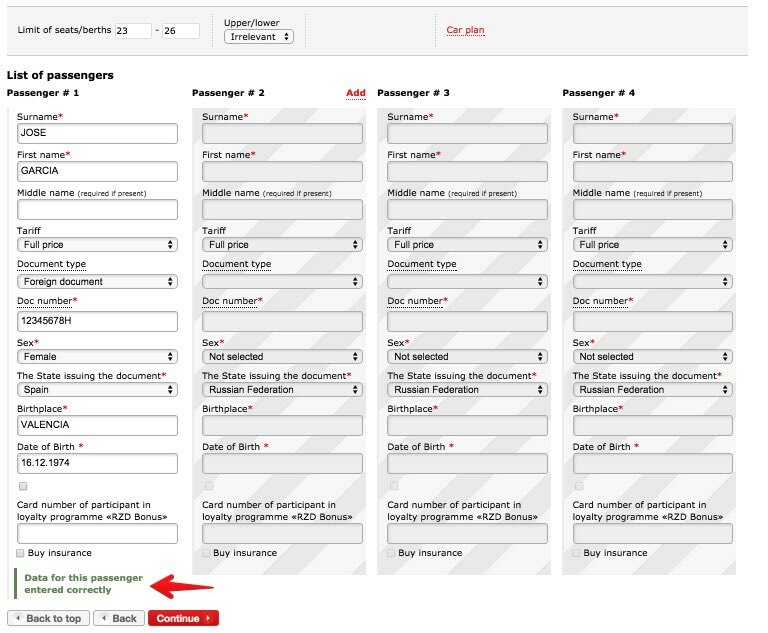 Once you have selected seats in the same compartment, click the “Save” button to continue with the booking process. 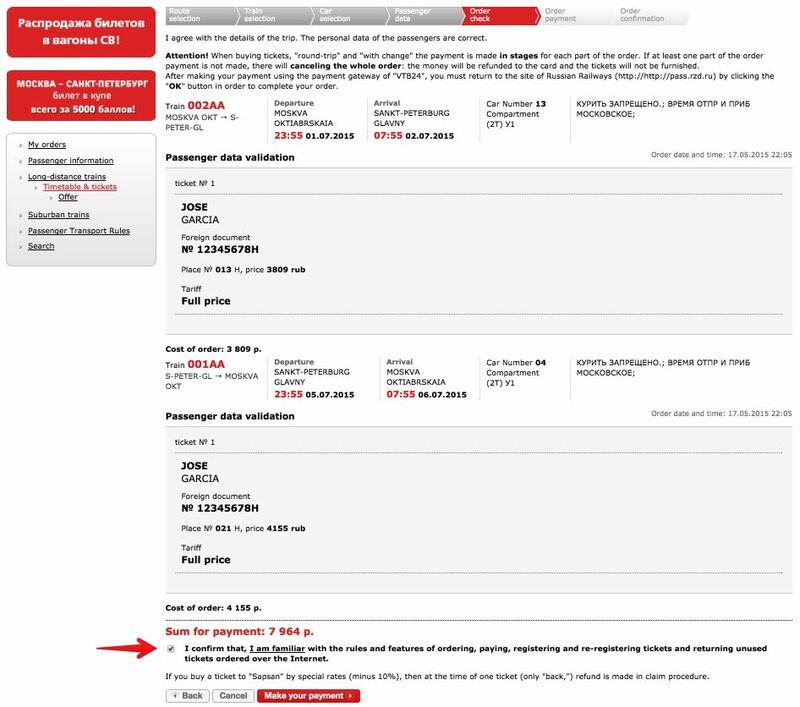 Once you have completed all the data correctly, the message “Data For This Passenger Entered Correctly” appears. If you need to include more passengers you have to click “Add” (to add passenger). You also have the option of purchasing cancellation insurance, but it is in Russian. Your origin and destination, date and time of your trip, and your personal data have all been entered and now it is almost time to pay; the next screen will summarize how your booking data will appear. If everything is correct, you should tick the box to confirm that you agree with the conditions of the reservation (“I confirm that …”). If something appears to be incorrect, you can always go back in the booking process by clicking the “Back” button. The system automatically generates electronic tickets and will forward them to your e-mail, ready to print. Your tickets are also available and accessible via your account on the RZD website. 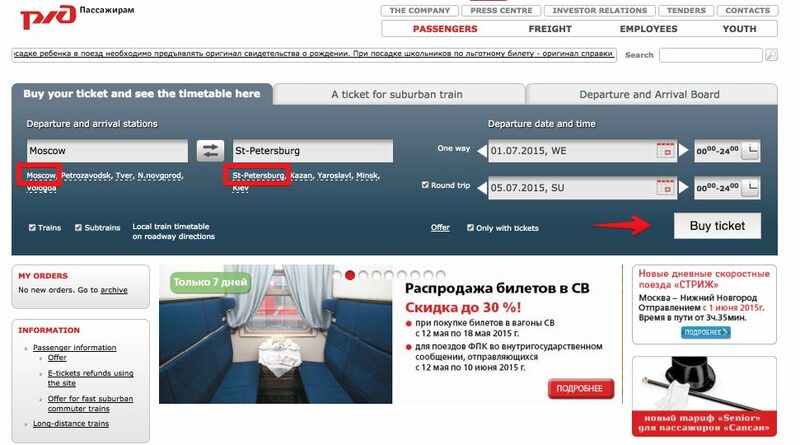 There are many websites that sell train tickets for the Red Arrow, Grand Express, Trans-Siberian, etc. Many of them apply abusive commissions so you have to pay attention to the prices they charge. 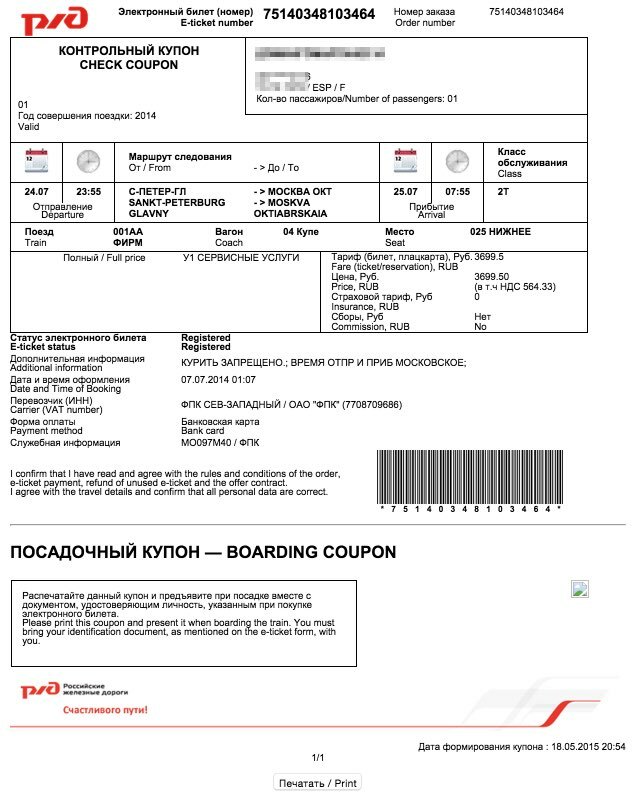 I always recommend buying tickets online on the RZD website, however, there are those that cannot complete the reservation process on RZD because their card does not work. In this case, I recommend Tutu Travel for buying tickets. Through this web site (also in English), you are also buying tickets directly on RZD, but there is a small commission (350 – 550 rubles per ticket). 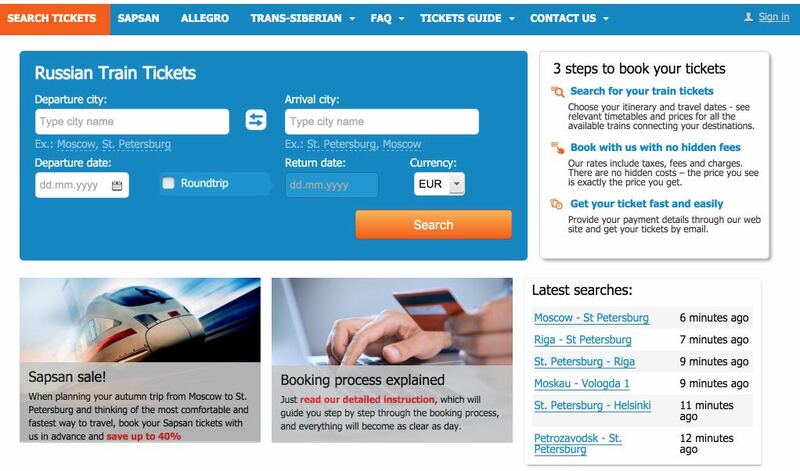 I hope this tutorial has helped you book your train tickets to travel in Russia online.